Driving in Maui has many benefits. Despite the natural tropical beauty, the year-round pleasant weather, the ocean sights, or the beautiful sunsets, Maui still has it’s driving challenges. One driving challenge is the high volume of tourists that you are sharing the road with. These tourists are not only captivated by the beauty of Maui but sometimes they are preoccupied with the desire to capture that perfect photo while exploring the island. This eagerness sometimes overshadows driving safely. Tourists are also challenged with the task of reading the Hawaiian named street signs. Even with modern GPS and smartphone technology, trying to distinguish all those vowels and foreign names while operating a vehicle can be difficult. So when driving, be prepared for abrupt stops or random slowing from tourists. Being distracted by the Hawaiian beauty while trying to navigate, tourists are unfamiliar with operating their rental vehicle. Their rental is not the car they spend countless hours driving to and from work each week. This is a completely different vehicle. Tourists likely have no idea how their vehicle will handle around a sharp turn; or how effective or ineffective it is at braking. So heed extra caution! One factor most people neglect to take into account is the large axis deer population. Deer in Maui? Yes! The axis deer population on Maui is estimated between 50,000-100,000. Experts also predict that the population will continue to increase. This massive deer population causes accidents around Maui each day. 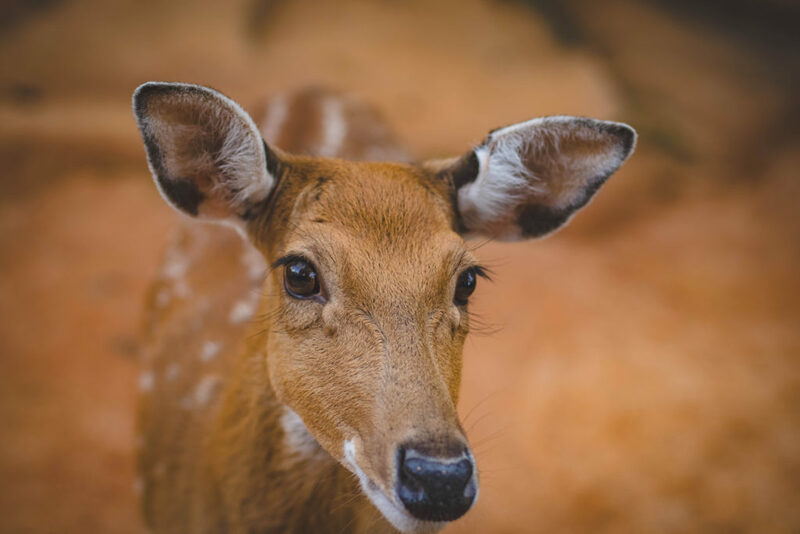 When driving in the less inhabited areas, anticipate that deer may be near, and keep your vehicle within the designated speed limits. The last group of potential hazards to your vehicle are surfers. On Maui, there is a substantial surfing population. However, there’s a lack of beach parks to accommodate all these wave seekers. This means that surfers or beachgoers have to park along the roads and highways to access the beach. This poses a challenge to drivers because there are big groups of cars lining highways at random locations. Also, these beachgoers are attempting to cross the busy streets without any traffic lights or crosswalks to support their safe crossing. In addition to the lack of infrastructure to aid in crossing, these surfers might be distracted by the beckoning call of the ocean, which may lead a surfer to not notice the rapidly approaching cars. When approaching a large group of cars parked along the side of the road, slow down to give yourself enough time to stop, allowing surfers to cross the road safely. Slowing down is also crucial because it’s common for surfers to underestimate the size of their boards. 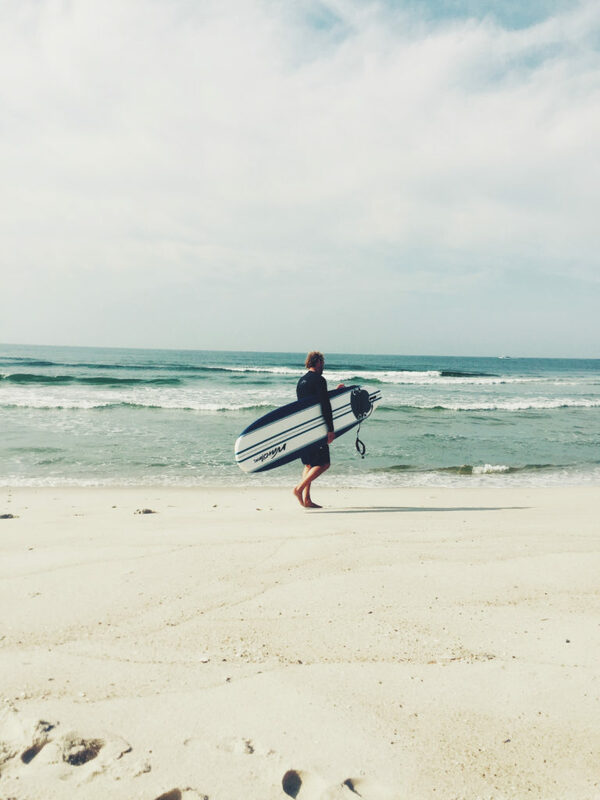 It’s common for surfers to be crossing the highway carrying large longboards often ranging 10-12 feet in length. So when the surfers are peeking their heads out to look for oncoming cars, their boards might be sticking out on the road 2-3 feet. These massive boards could do major damage to your beautiful car as well as inflict harm to the surfer. In summary, when taking in all the beauty Maui has to offer, be sure to remind yourself of whom you are sharing the roads with the tourists visiting, the axis deer population, or of the eager surfers or beachgoers that are dangerously attempting to cross busy highways and streets with no assistance. Be sure to remind yourself that this is Maui and we don’t need to be driving so fast. So prepare accordingly, and always drive with Aloha. Maui is host to an array of outdoor activities that take advantage of the gorgeous landscape and diverse climate of the island. While many in crowded Tokyo districts or NYC high-rises would be happy staying inside their home or hotel all day, that is not the case on this island! Visitors and locals alike enjoy daily outdoor activities ranging from surfing, diving, zip-lining, and biking. One of the main attractions, however, is the beautiful hiking on Maui. There are too many gorgeous and challenging hikes to provide an exhaustive list below, but here are some of the best trails broken down into difficulty levels to get anyone started, and at any level. Besides the beach, one of the first images that people associate with the Hawaiian experience is the iconic waterfall. The Twin Falls trail located on the Road to Hana may be labeled as easy, but even the most seasoned hikers do not want to miss it! Visitors enjoy strings of cascades, freshwater pools, and remarkable foliage each fed by the ample Ho’olawa Valley rainfall. Conveniences like parking, porta-potties, refreshment stands, and free admission accommodate for a wider range of ages and expertise as well. The most popular site on the trail is the “Caveman” waterfall, as it is home to ancient caves and ideal spots for cliff-jumping enthusiasts. On average it takes about 30 to 45 minutes to reach Caveman on this easy hike, and it is approximately 1.3 miles. A more challenging yet moderate trail is the Hoapili Trail. Make sure to bring some adequate footwear like hiking boots and lots of water, as the walk will take you over jagged lava fields from the 1790 eruption of Haleakala. This trail is located at La Perouse, an area south of Wailea and equipped with a stunning oceanfront archaeological site that remains culturally significant to Hawaiians. Many also refer to this trail as The King’s Highway. The trail passes through lava fields, sandy beaches, *kiawe trees, and low sea cliffs. The ancient Hawaiian ruins and structures along the way eventually open up to dazzling and crystal-clear olivine pools. Overall the hike is about 5.5 miles. *Kiawe: a thorny tree, Prosopis juliflora, of the legume family, native to South America and widely naturalized in Hawaii. Lastly the most difficult trail, Kaupo Gap, where you will certainly find any desired solitude on this scarcely populated seven-mile hike. 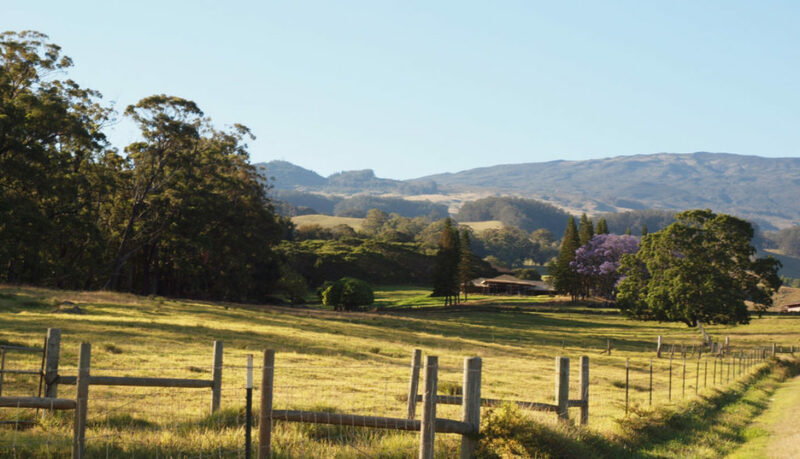 The breathtaking views of the “gap” in the Haleakala crater rim wall, along with the breathtaking koa forest, ohia trees, and endangered birds are just some of its points of interest. Kaupo Gap begins at the three-way intersection with Lau’ulu Trail and Halemau’u Trail, taking the Kaupo Trail south down the crater floor to trek down the steep volcanic terrain. Often, hikers mitigate the challenging trail by setting a pickup destination near Piilmani Highway 31 or using an experienced guide from websites like MauiHikes.org. Heed any markers and be careful of steep grades, high altitudes, and rocky paths. Although the switchbacks can also be intense, they are punctuated with beautiful views of the Big Island and Pacific ocean. 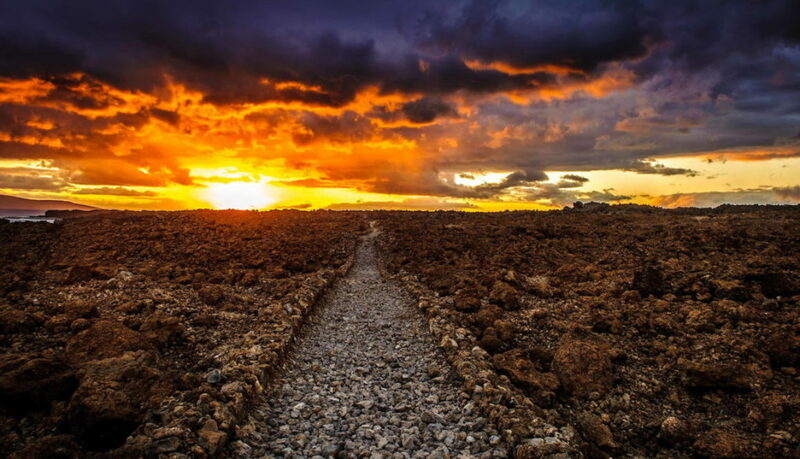 The header for this image of Hoapili Trail was taken by Daniel Sullivan.